As the ozone layer continues to thin, the damaging rays of the sun reach earth more easily. This has resulted in increased incidences and numbers of skin cancers. This has resulted in everything from increased research into the effects of ultraviolet light on the skin to an avalanche of products designed to protect skin from the harmful rays of the sun. As a result, most people have become very cautious about spending time in the sun. Ultraviolet rays of sunlight are absorbed through the epidermis of the skin. This is the outer layer of skin. If you get sunburned, the effects go deep into the dermis, or middle layer of the skin. This is what causes the resulting redness on the skin’s surface. Besides the redness, the genetic makeup of the epidermis can also be affected. This is the damage that can potentially result in skin cancer. According to information found at the American Skin Association™ website, the sun’s rays can also have a negative impact on the body’s immune system. This can mean the skin will have a difficult time repairing itself. In addition, the rays can attack the pigment cells of the skin. When this happens, the body’s defense is to increase the production of melanin. The result can be freckling and brown spots, or age spots. The consequence of this is that it can also contribute to the onset of skin cancers. Exposure to sun rays also contributes to the loss of elastin and collagen that supports the skin structure. This results in early signs of aging and includes wrinkles and the sagging of skin. When this happens, the small blood vessels of the skin are not supported, which means they can become dilated and visible as spider veins on the chin, cheek, or nose. Even though the facts make things sounds grim, the truth is, there are simple ways to protect yourself from the harmful rays of the sun. You don’t have to avoid sunlight all together. One of the simplest ways to protect yourself is to spend outdoor time in the shade. Direct sun exposure should be limited during the hours between 10am and 4pm – especially in the springtime. This is when the rays are strongest. Covering up with lightweight clothing is another way to enjoy the outdoors without worrying about over-exposure to UV rays. Keep in mind that tightly woven fabrics provide better protect from UV rays than loosely woven ones. A wide-brimmed hat can protect the face, scalp, ears, and even the neck from the most intense rays of the sun. Even a baseball cap or straw hat can be helpful. Sunglasses help protect the eyes and the delicate area around the eyes. The label on new sunglasses should say the glasses meet ANSI UV requirements. Sunscreen should be used any time you will be exposed to sunlight. Products that offer broad spectrum protection with a SPF of at least 30 are recommended by Cancer.org. 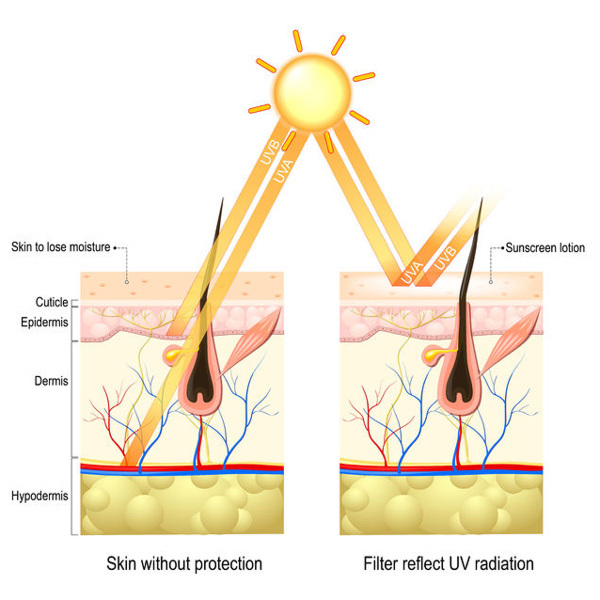 The best way to protect your skin from UV rays is to practice the tips given in this article. Remember to limit your exposure to sunlight and to use sunscreen as well as protective clothing, hats, and sunglasses. In essence, keeping your skin safe from UV rays really isn’t that difficult. You just have to be diligent in your efforts. Take the time to make being cautious a habit and your skin will be safe from the harmful rays of the sun.